The English program is based on two assumptions. The first is that mastery of one’s own language is essential to an individual’s personal development; he must be able to express himself clearly, communicate with and persuade others. The second assumption has three parts: that the experience of great literature allows us to enlarge our experience of and ability to deal with the world we live in; that contact with the best thoughts of the best minds can be a source of wisdom and delight; and that the individual can better appreciate his own values and those of his culture if he is familiar with the process by which they have evolved. No Upper School English program can possibly provide students with all the instruction in language and literature that they will ever need. Properly understood, education is a lifelong process. An effective English program equips the student with the skills he will need to pursue formal study and to continue the self-educational effort that marks and makes the well-rounded individual. Form III English exposes students to a variety of literary works, including novels, short stories, plays and poems. Building on the work of the Middle School, more literary terms are introduced, and the structure and function of literary forms are examined. The reading of literature provides a foundation for the integration of grammar, spelling and vocabulary lessons within the framework of a comprehensive study of the writing process. Considerable time is spent on planning, writing, evaluating and revising essays in order to produce writing that is clear, concise and persuasive. Time is devoted to developing better study skills and habits, with emphasis on organizational, reading and analytical skills. Students will use interactive online programs for grammar studies and vocabulary enrichment. Fall Term: Texts include Achebe, Things Fall Apart; Hilton, Lost Horizon; Homer, The Iliad; Shakespeare, Julius Caesar; and selected stories. Spring Term: Hansberry, A Raisin in the Sun; Mishima, The Sound of Waves; Salinger, The Catcher in the Rye; and selected poetry and essays. This semester-long Form III requirement is designed to help students develop excellent oral communication skills and to teach them to express themselves in a clear and articulate manner in all circumstances, including classroom discussion, debates, interviews, persuasive oratory, and other public speaking occasions. Students are encouraged to develop confidence and poise when they present themselves in their public and personal lives. Emphasis is placed on content as well as nonverbal communication, with additional focus on the incorporation of technology in presentation. Form IV English provides an introduction to the history and development of the English language and a survey of selected literary forms. The reading is chosen to encourage discussion of such themes as maturity, decision making, the dignity of the individual, friendship, fate, and moral integrity. Strategies for approaching, reading, and retaining a knowledge of challenging texts are discussed and implemented. The reading covers a wide range of material from Beowulf to Shakespeare, Geoffrey Chaucer to Philip Larkin. Some memorization is required. Students are required to plan, write, and revise organized, supported, and persuasive analytical essays, with an emphasis on the incorporation of textual support. Grammar study and vocabulary are pursued in textbook exercises and in the context of reading and writing assignments. Students will use the Sadlier-Oxford, Vocabulary Workshop, Level F for vocabulary enrichment. Fall Term: Finding Order. An examination of the increasing complexity and flexibility of the English language. Texts may include selections from Beowulf; a selection of ballads; selections from Chaucer’s Canterbury Tales; Shakespeare’s sonnets; Vonnegut, Cat’s Cradle; Swift, “A Modest Proposal;” Shakespeare, Macbeth. Spring Term: Romanticism and Beyond. McCullers, The Ballad of the Sad Cafe; Miller, Death of a Salesman; Dickens, Great Expectations. Poets studied include, Blake, Wordsworth, Byron, Shelley, Keats, Tennyson, Arnold, Housman, Yeats, Thomas, and Larkin. Students will approach selected works of American literature not only as sovereign texts but also as products of the developing culture of the United States and expressions of concerns uniquely American which can be traced through our literature from colonial days to the present. The course will be structured to encourage students to recognize the connections between the Form V American history course and the American literature they will read in this course. Students will also continue the development of their writing skills through expository and creative writing assignments on topics related to the reading. Fall Term: Fitzgerald, The Great Gatsby; Twain, The Adventures of Huckleberry Finn; Wright, Native Son; Baldwin, Notes of a Native Son, Thoreau, Walden; Hughes, poems. Spring Term: Hemingway, The Sun Also Rises; Crane, The Red Badge of Courage; Chopin, The Awakening; Tyler, The Accidental Tourist; and selected poetry by Frost, Millay, Dickinson, et. al. Students in Form VI take a mandatory fall class, Advanced Expository Writing, in which they write and workshop essays that could fulfill their college application requirements. Each boy will write several essays, all of which might be submitted to colleges. The essays they write will be based on the essay prompts given to them on the Common Application for colleges and universities. Additionally, they will be encouraged to work on supplemental essays derived from topics offered by the individual college to which they are interested in applying. In addition, Form VI boys select two different courses during the year. These electives change from year to year and are designed to suit the interests and needs of the students, to approximate in their general approach the literature courses encountered by college undergraduates, and to bridge the gap between high school and college-level work. Courses in recent years have had thematic, historical,or genre orientations, and writing courses of several kinds have been offered. The following choices are presented to students for the 2017-2018 school year. Keeping in mind that art mirrors life, and all the world’s a stage, we cover a number of the highlights of drama spanning the 20th and 21st centuries and explore questions of how playwrights have used their craft to reflect back, to comment on, and even to affect the world they see around them. Class participation will include close reading, large and small group discussion, analytical and response writing, and a creative project. Texts will be supplemented with relevant historical documents and film versions of the plays. How do governments seek to control their constituents, and to what ends? In what ways does a political state mirror the human weaknesses of those who administer it? Each work considered in this course offers a different vision of governance gone awry. Orwell, Huxley and Atwood borrow the guise of science fiction to address such questions, which press urgently upon our present moment. McCarthy, meanwhile, imagines a total collapse of societal infrastructure in order to examine how we might, in our darkest hour, start to rebuild. 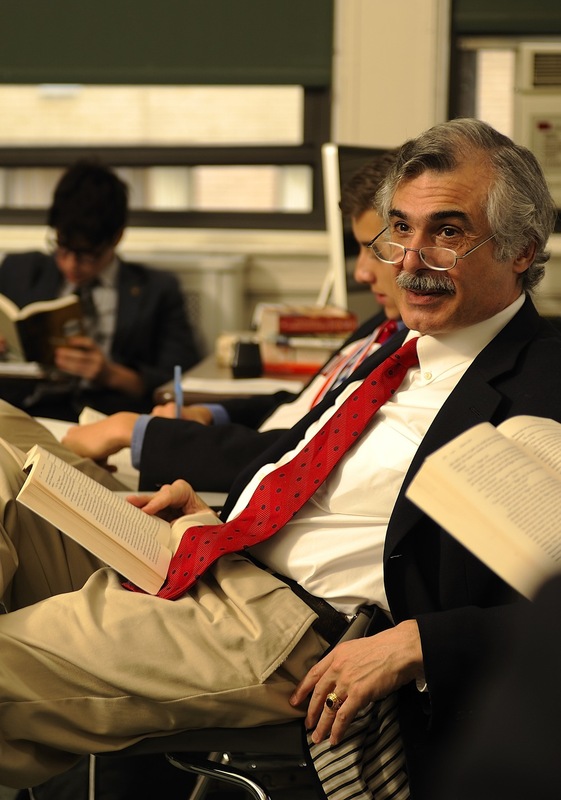 Students should expect to read and participate enthusiastically in discussions on a daily basis, as well as to produce both analytical and creative writing. Texts: Orwell, George, 1984; Huxley, Aldous, Brave New World; Atwood, Margaret, The Handmaid’s Tale; McCarthy, Cormac, The Road. Second Semester offerings to be announced later.